Meet Clarence: our new livestock guardian! Clarence is a 5 year old wethered alpaca (that means he is without his reproductive jewels) who came to us from Yarmouth in November. Although Alpacas aren't generally kept as sheep protectors around here they are used widely throughout Australia and New Zealand (land of the sheep) and from our research we've decided that he would be a wonderful addition to our crazy farm! Living in Nova Scotia means living with coyotes and, although I am most definitely NOT on the "I hate coyotes and want to shoot them all" train, I am also not interested in losing my lambs to them. SO I did what any business owner would do: I hired security! 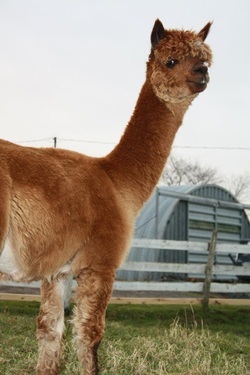 Alpacas are a member of the South American Camelid species (along with the llama, camel, and vicuna) are are known to be hardy, intelligent and very sociable. They have strong herd instincts and both males and females are very protective of each other and their young. The alpaca also bonds well to other animals in their herd (or in our case, flock) and will stand to protect them as well. They are usually gentle with humans and other animals that are not seen as a threat but they have natural hatred for canines and foxes. They will chase the threat and stomp on them with their front feet, which are padded with large nails rather than hooves, and continue to stomp. I have heard from many people in the Maritimes say that Alpacas "will run away if they sense a threat" and "are not to be used as guardian animals" but these people obviously have not seen Clarence in action! 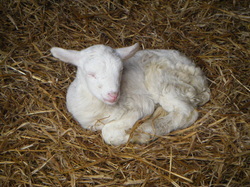 Within the first week of introducing him to our flock (14 sheep in total at this moment) he had created a bond. When I entered the pen he would get in front of the ewes and call out as if warning them to stay behind him. I brought the dogs with me in the second week to see his reaction. When he heard Dusty bark he immediately called out, shot his ears back, stood tall and proceeded to walk along the fence line (don't worry, I had the dogs in the car with the windows rolled down for the introduction). We will be adding a guardian livestock dog to our family in the coming months as a secondary security measure but for now Clarence is living up to his expectations and fits in with our kooky farm wonderfully! Some of you may have noticed the rather large amount of snow Mother Nature decided to drop on us last week. Well, it just so happens that our order of heirloom garlic arrived the day before this storm and for some reason, I actually thought it was a good idea to get out there and pound it into the semi-frozen ground before it got too bad. The garlic comes in big blue mesh bags and is fully bulbed, it took me almost 3 hours to break apart the 200 bulbs into their cloves (6-10 cloves/bulb) and I then headed out the door. It was Tuesday and I thought I would be able to plant all 1500 cloves into the ground in a single afternoon - I was wrong. This is mid-November and the sun, with all of it's brightness and warmth, is long gone by 5PM. Also, the top of the soil is now frozen which means each hole needs to be pounded in using one of those super heavy metal poles that is pointed at one end (used for fencing?) and then closed with a hammer. By 4:00 I had 700 cloves in and just enough time to grab some milk and veg for the pigs before I lost my light for the day. I wasn't worried though, because the snow wasn't supposed to start until after lunch the next day - plenty of time right?! Sooooooo it was already snowing I woke up Tuesday morning. Like, so hard. The sun was up by 7:30, I fed as fast as possible and was in the field- planting bags on, hammer and long metal bar in hand by 8:30 and went to work. It was cold. People always say that it warms up when it's snowing, but these people have obviously never planted garlic in a snow storm. Snowy River Farm is located on top of a hill so it was cold AND windy - and everyone who is anyone knows how much I despise the wind (it's always pushing me around, what's up with that?). I turned up the volume on my little green Ipod shuffle put my head down, and let Adele, Fleet Foxes, Bon Iver, and Robbie Sinclair and the Beggars Laughing take me to a nicer place. It felt like I had been out there for hours, I could no longer feel my fingers and the bags never seemed to look any more empty than when I had started when Rob took pity on me. Or maybe he didn't want people driving by to see me in his fields planting in a snow storm and think that he had any association with me, so he sent David out to help! We were done, frozen, and tired by lunch (when the snow was SUPPOSED to start) and walked back to the house in 6'' of snow. Part of me thinks "Wow, I'm a planting warrior. Check me out. Planting in a snow storm - Heck yeah!" but then I look outside one week later, at my muddy front lawn. Naked of snow. Birds chirping. Etnie frolicking sans her winter coat. I now think "You idiot". Next year the garlic will be our own, no ordering and waiting for shipments. And it will see its winter bed in October. Ok, so I said that I would NEVER start a blog because I couldn't possibly see myself having the time to sit down, gather my thoughts, and then write them out in such a way that it didn't seem pure word vomit being thrown at you....no guarantees but I will try my best to keep them short and concise! Snowy River Farms has now been through an entire growing season: seeds were planted, they grew into seedlings, were transplanted into the prepared beds, grew like the devil into deliciously wonderful vegetables that fed both our family and customers of the farm, and we are still alive so all in all it was a success! We are now in the planning phase for our 2012 CSA (Community Supported Agriculture) which pretty much means I am frantically trying to decide how much seed to order, how "interesting" I should be with the varieties I choose, and where the land for all of this seed is going to come from! We've already prepped the herb garden by the house with chicken compost from the summer as well as a layer of duck manure mixed in with straw. With all of our animals we do what is called a "pack barn" or "compost litter" in which we turn the bedding weekly and add fresh bedding directly on top as it is needed instead of completely removing litter as it becomes dirty. When done properly there is no smell of ammonia and beneficial bacteria are able to grow and break down the litter into a clean, nutritious compost that can be placed directly on the garden in the spring. Another benefit of the compost litter system is the heat it produces while breaking down, which in turn, keeps the livestock toasty warm during those terribly cold months! We are currently using this style of bedding for the pigs, sheep, chickens and ducks so there will be plenty of compost for our vegetables to use come March!